Today: In time for Halloween, Associate Editor Marian Bull remakes a childhood favorite -- with just the right amount of crunch. We all have the stories about ourselves that we whip out at cocktail parties or on slow-moving first dates -- stories sure to entertain people, or make us sound a little more interesting than we are, or, ideally, both. Mine is that I grew up performing in a live-stage magic show every Sunday of my life; in the 70s, my parents bought an old vaudeville theater with a bunch of other hippies and a psycho Cuban man, and renovated it by hand. Then they started putting on magic shows, and showing second-run and art house movies on off nights. This also meant that I ate a lot of candy. Like, the amount of candy you are afraid your child will eat come Halloween, so you pay them to give some of it up. Twix bars were my biggest vice, but I also had a thing for Crunch bars, thin and crispy and milky sweet, wrapped in foil like Charlie's golden ticket. It's a miracle I didn't turn into an oompa loompa. More: You can make your own Twix bars, too. 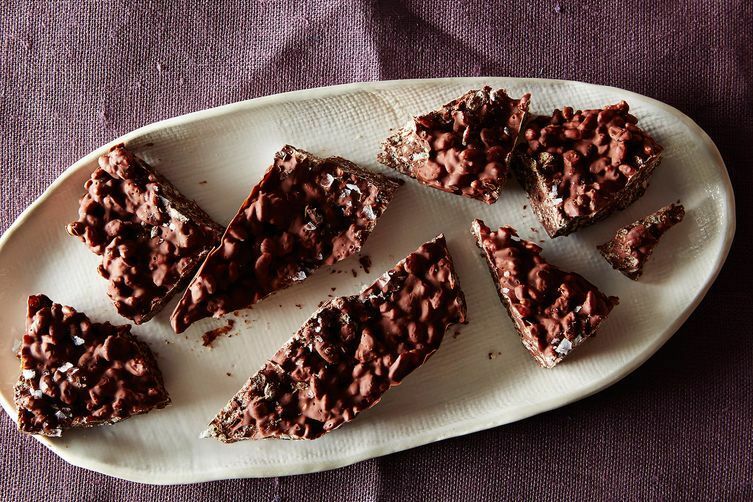 I recently realized that these Crunch bars would be stupid-easy to recreate at home. They consist, mainly, of puffed rice cereal and chocolate, plus all the other disgusting stabilizers and superfluous things that candy companies put into their products. More: You can also use that rice cereal to make chocolate-dipped Rice Krispie Treat S'Mores. 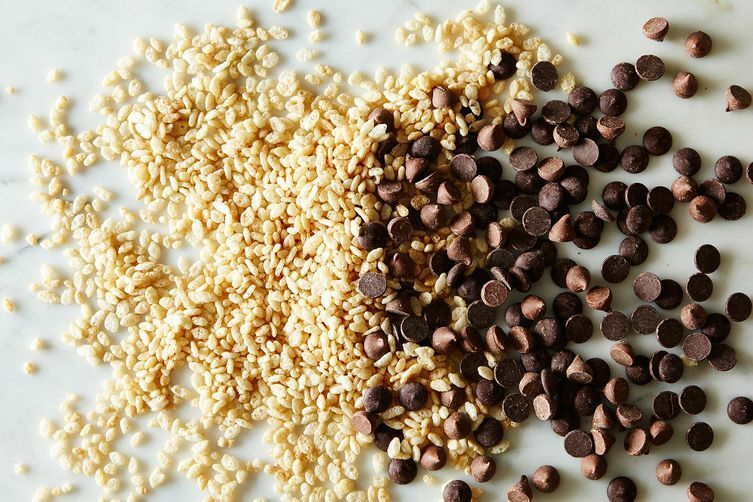 What we realized when making our own Crunch bars at Food52 HQ is this: You get to choose your ratio of crunch to chocolate, which is a very good thing. You also get to choose your chocolate -- I like a mix of dark and milk (chips work just fine). And you can dress them up however you like, with a sprinkle of flaky salt (please do this) or cacao nibs or even mini M&Ms. 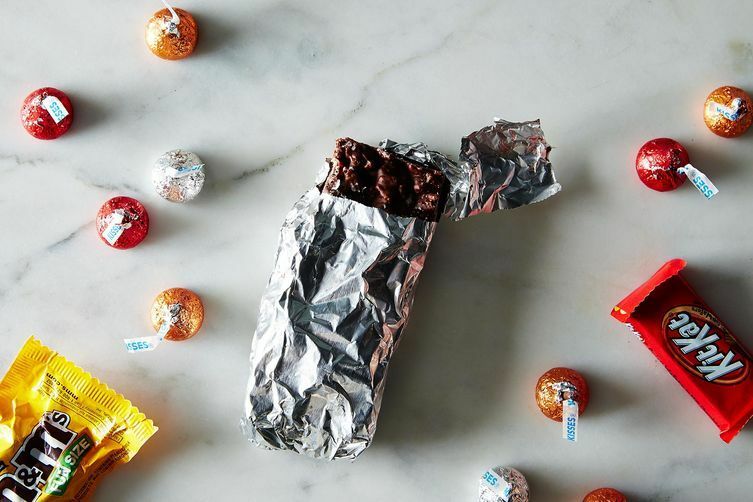 So whether or not you have weird candy bar PTSD like I do, I recommend reclaiming the Crunch bar -- it's a good thing to keep on hand for snacking (I'm thankful for the stash in my freezer), or gifting, or handing out to trick-or-treaters. They have cereal in them so you might find yourself calling them breakfast. And then telling people all about it at your next cocktail party. I promise they will find you fascinating. First up: Stock up on Rice Krispies and whatever chocolate you fancy; as I said, chips are fine, and I recommend a mix of milk and dark. Line a baking pan with aluminum foil. 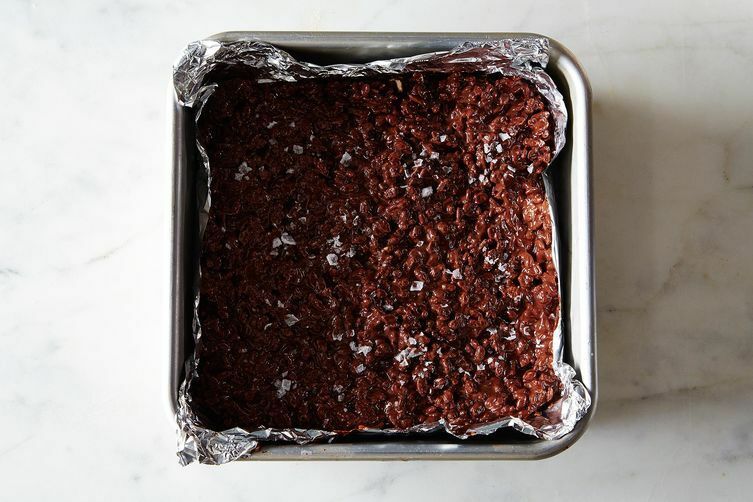 If you want thicker bars, use an 8- x 8-inch pan. 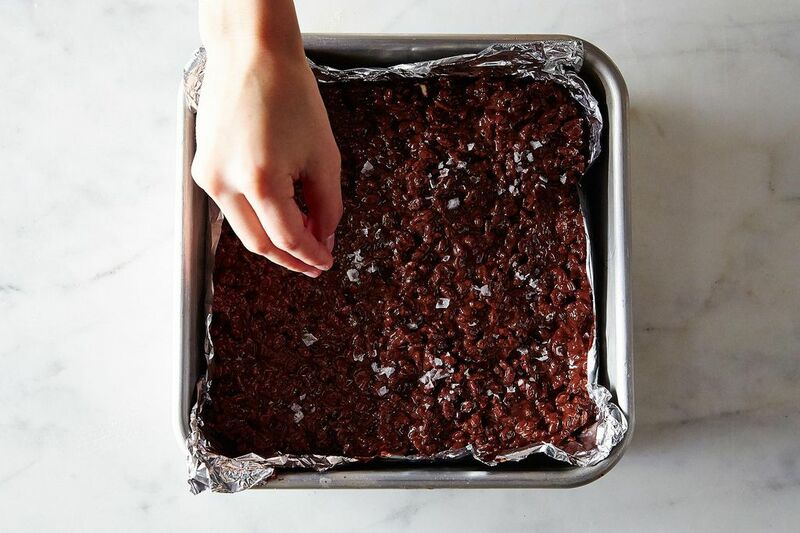 If you want thinner bars, use a 9- x 13-inch pan. 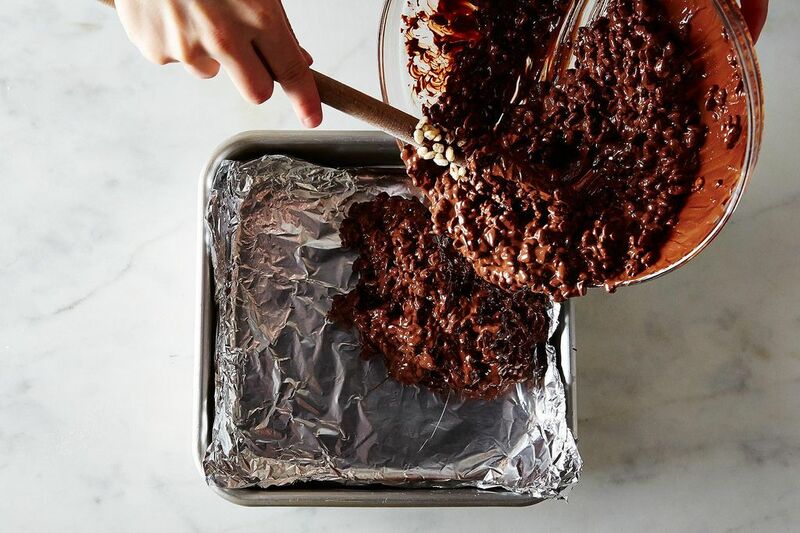 Melt the chocolate chips in a small pan over low heat, making sure not to burn the chocolate. You can also do this in the microwave: Make sure the bowl you use is microwave-safe, and nuke your chips for 30-second intervals, stirring after each, watching carefully so they don't burn or sputter. 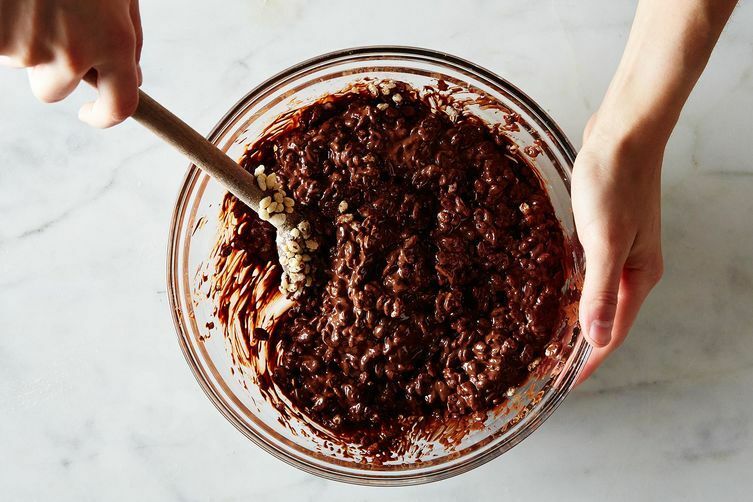 When the chocolate is melted and smooth, fold in the Rice Krispies and anything else you want incorporated into the bars. Smooth the mixture into the baking sheet and top with flaky sea salt, if using. Freeze until set. 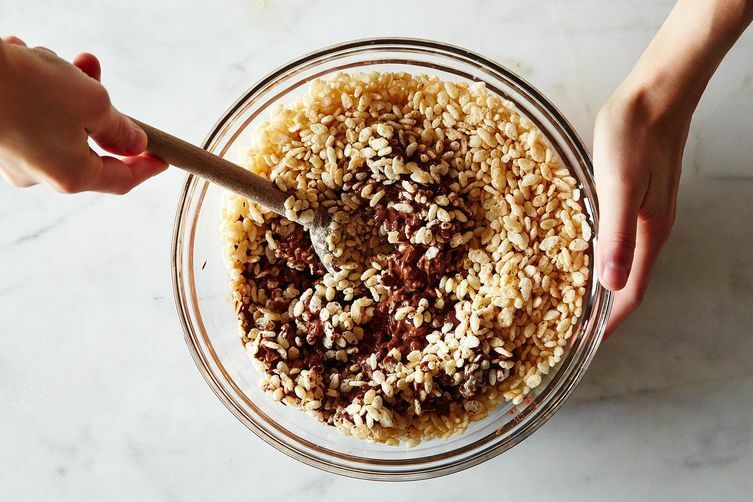 Slice your bars with a sharp knife, then wrap them in foil, or parchment, or wax paper, or just set them out on a plate for your next Halloween party (or the next time that your coworkers look like they're in need of a snack). Your bars will keep for at least a month in the freezer, but I hope you eat them before that. You are a grown-up and you get to eat as much candy as you want. How quickly will the choc begin melting in one's hands? I always add two tbs of honey and a bit of butter, and combine dried sultanas, nuts, apricots, cramberries and all sorts of dried fruit. Honey and butter make it a bit softer and more kids friendly. Great, easy recipe. I used Special k, since I didn't have any puffed rice cereal. Sets up quickly, so would be a good emergency dessert too! I just lol-ed at your intro. Actually out loud. But no ROFL? I ROFL'd! I've been making something similar almost weekly lately, but with brown rice puffs, cacao, and a few other good for you ingredients. So addictive! This looks so yummy! I love alternatives to candy bars since they can contain ingredients I don't always love. This will be a great addition to a christmas present.